Born to a white mother and an absent black father, and despised for her dark skin, Helga Crane has long had to fend for herself. As a young woman, Helga teaches at an all-black school in the South, but even here she feels different. Moving to Harlem and eventually to Denmark, she attempts to carve out a comfortable life and place for herself, but ends up back where she started, choosing emotional freedom that quickly translates into a narrow existence. The foreword states that if we don’t call Jane Toomer’s Cane a novel then the most accomplished novel of the Harlem Renaissance movement would be Nella Larsen’s Quicksand. I discovered Nella Larsen just recently while compiling books for different reading projects I have started, one of them being dedicated to African-American writers. 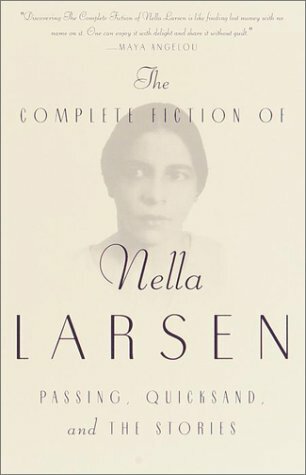 Nella Larsen is, like Zora Neale Hurston, and some other African-American writers, a mystery. Nella was born to a Danish mother and a West Indian father. These mixed origins are reflected in her work. She wrote only two novels, Quicksand and Passing (which I will review later) and three short stories. After an unsavoury accusation of plagiarism concerning her last short story, she stopped writing. This may or may not have been the reason, it isn’t exactly clear. Before she started writing she was a nurse, later became a librarian and after she stopped writing, worked as a nurse again during the last 30 years of her life. A lot – like in Zora Neale Hurston’s case – isn’t clear. It was never really established when she died, she went under many different names and she fabricated stories around her biography which obscured the facts. Quicksand is a wonderful novel. I enjoyed it a great deal. It has so much to offer and reminded me at times of the novels of Elizabeth Taylor which is high praise. Helga Crane, the main character, is one of the most interesting heroines I’ve come across recently. A fascinating character. Quicksand explores different themes, the most important are race and gender. It was interesting to read about this. What would it be like if you were constantly aware of the color of your skin? If what you look like is more defining than who you are? 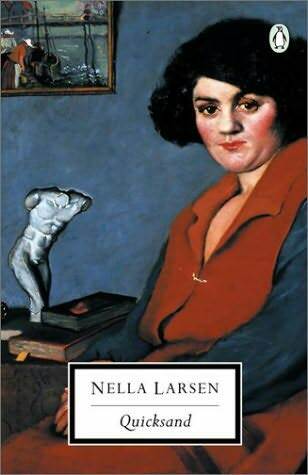 For Helga this is doubly tragic as she is, like Nella Larsen herself, of mixed origins. The mother is Danish, the father Afro-American. She isn’t accepted by the Whites and mostly has to hide her white heritage from the Black people around her. There is such a thing as a Harlem High Society and Helga, being a beautiful woman, frequents this society, the cabarets, cocktail parties, salons in which endless discussion on race bore her. At the beginning of the novel she is a teacher in Naxos but restlessness and contempt for the methods that are applied there, lead her to leave and go back to her home town Chicago. This wasn’t such a good idea, as she has to realize, as it is hard for her to find another job. On top of that she loves nice things, clothes, accessories and spends too much. Luck is on her side and she finds an employer who takes her to New York, introduces her to the high society of Harlem. A beautiful rich widow, Anne, lets her live at her place until, once more, after some months, she is restless and decides to go to Denmark to visit her mother’s sister. In Denmark she experiences another side of racism. She is paraded and admired like an exotic animal. One of the most famous men, a painter, wants to get married to her. She enjoys her stay in Denmark. Like before in New York, she thinks at first that she has found “her place”, her home. But once more she gets restless and returns to New York. Offers for marriage are frequent and equally frequent are her refusals. It is also typical for Helga to be happy when she newly arrives in a place and to see it lose its lustre after a while. When the enthusiasm fades, she is prone to nervous attacks, panic and depression. At the end of her second stay in New York, this happens again. Helga’s life is a sequence of bad choices, of restlessness, pervaded by a deep feeling of not belonging. When, in a stormy night, she lands in some Christian congregation, she grasps the opportunity to be “saved” and when the pastor asks her to marry him, she accepts and follows him to Alabama. Her first months in Alabama are full of bliss. She enjoys married life, to be the wife of an important man. There are a few signs here and there that this is superficial and the surface will crack soon but before her first child is born, she is feeling happy. Everything contributed to her gladness in living. And so for a time she loved everything and everyone. Or thought she did. Even the weather. Ad it was truly lovely. By day a glittering gold sun was set in an unbelievably bright sky. In the evening silver buds sprouted in a Chinese blue sky, and the warm day was softly soothed by a slight cool breeze.And night! Night, when a languid-moon peeped through the wide-open windows of her little house, a little mockingly, may be. Always at night Helga was bewildered by a disturbing medley of feelings. Challenge. Anticipation. And a small fear. The last part shows us a broken Helga. Someone who looks back on a ruined life, who hates motherhood or rather bearing children. By now she is the mother of five children and we know there will be more. She tries to make friends but her natural elegance and haughty looks keep her always outside. I really liked this book, because I liked the writing and I loved Helga Crane. She is an endearing character with all her wishes, her longing, the restlessness and the feeling of being an outsider wherever she goes. We can see in her every outsider, every human being who doesn’t fully belong, every one who is looking for something to transcend the ordinary. She stands for so many people who are different. But she also stands for the many women who find it hard to live the life of a wife and mother, who are worn out by birth. Helga is a tragic figure and did remind me of a friend of mine who, full of hope for something better, turned down every good job offer he got and finally, running out of opportunities, had to go for something far below his capacities in the end. There are many interesting parts on race and gender and the criticism of many aspects – for example Christian faith and its promises of a later redemption in which so many Afro-Americans believed and which held them down for so long – are intriguing. I’m looking forward to read her stories and her second novel Passing. I should add that both novels are very short, only 130 pages long. I hope this tempts you. It reminds me of the Hanke book you reviewed lately, a woman who lives motherhood (and non-chosen pregnancies) like a burden. (Being a woman doesn’t mean that your dream in life is being pregnant and take care of a tribe of children) But here Helga seems to have more alternatives and has made bad choices rather than faced the absence of choice. Recently, I heard someone’s interview on the radio. He (I don’t remember his name) has written a book about people with mixed origins. He said that we often consider it as a chance (knowing two cultures) but that the persons sometimes have difficulty to know where they belong and suffer from it. PS: About characters with mixed origins, have you read The Time of our Singing by Richard Powers? It isn’t a bleak book, Handke was extremely bleak. I didn’t enjoy it but I really liked this one. She does make so many bad choices that’s really her problem. She could have married a more suitable man but she didn’t dare. Deep down she was ashamed to be of moxed origins. I have Power’s book here and should read it. I am not mixed like they are but coming from different cultures, speaking different lanaguages always gave me the feeling to be an outsider to a certain extent. Skin color is a different story than just being different in another way but I can understand what it is like. In Helga it is two things, she feels she doesn’t belong and she isn’t fully accepted. In my case it is a cultural thing as from a language perspective I blend in. I have no accents in any of the languages I speak but there are many things where I feel I’m neither this nor that. But race is another level of difference. I need to read Power’s book. I was introduced to Larsen just recently and you have me moving her up on my TBR list. Thanks for a wonderful review. You are welcome. I think Passing is said to be even better and I’ll read it soon and post on it. I am curious to to see what you will think of it. I’ve seen several good reviews of Passing lately, and so that book has been on my radar. This is the first one I’ve read about her other novel, which also sounds most intriguing. Her life also fascinates me – people who obscure their trails are so interesting. I’d really like to read more about her. And more by her! You should read her, I think you might like her. She is interesting for many reasons, her life as well as her fiction. Maybe she isn’t the colorful characater that Zora Neale Hurston was but it is worth exploring her. I’m really looking forward toread Passing and the short stories. This sounds fascinating! I did a report on the Harlem Renaissance in junior high, so I’ve always been interested in that period. I read about it most recently in Glorious by Bernice McFadden. Great review, as always! Thanks, Anna. I really think it is worth reading. I will have to check the book you mention. It’s a fascinating era. The music, the writers, the art. I would love to time travel to Harlem in the 20s of the last century. Imagine… And from there directly to Berlin! Both this and Passing have been on my wishlist for a while now. Thank you for the reminder to get to them sooner rather than later! Larsen sounds like one of those writers who deserve more recognition and a wider readership than they have. You are absolutely right, Nymeth, that’s what I thought too. I just started Passing and hope to write about it soon. Maybe the fact that she stopped writing 3o years before her death and the accusation of plagiarism which seems not justified, tarnished her reputation. I will stop by (it seems as if you are blogging again, then) and see what you think of it. I have not yet read either Zora Neale Hurston or Nella Larsen yet, though I have books by both on my reading pile. I’m also intrigued by them and that period particularly. I didn’t know anyhting about Larsen and didn’t realize she was half Danish–it must have been hard living on the fringes of society–not being entirely accepted by either. I definitely am tempted by her work! I’m sure you will like it. I’ve read Passing meanwhile and will post on it today but I defintely think I prefer this one. It is very hard to imagine how it would have been to be of mixed origins. From her novels I deduce that the African-American society was equally hard on its members and even more so on outsiders. It’s sad to see that they passed on the negative things they experienced. I read Quicksand in 2008 and absolutely loved it. I too, am fascinated by the Harlem Renaissance era and Ms. Larsen. I felt the plagiarism was never fully investigated and as a result America lost out on a gifted writer. I have a hint of what she must have felt having being accused of plagiarism while in college. I burned the oil lamp one night writing a thesis paper,turned it in and could not wait for the professor to tell me my grade. He called me in the other room, and said “This paper is too good to be written by you, and frankly I do not believe you wrote it”. I felt a big lump rise up in my throat and started blinking back tears. I just couldn’t believe he said that. I felt so humiliated and betrayed, not to mention staying up all night writing and how tired I was. I snatched my paper out of his hand and took it to the Dean. I told him what happened with the instructor, and he said, “He doesn’t really believe you plagiarized because if he did, this paper would have been in my office.” I said, “Would you read this paper and tell me what you think”. After he finished reading, he said, “While I would not accuse you of plagiarism, this is by far an excellent paper.” “It appears to be written by a published writer.” I told him I have worked in a research department for the past 15 years, maybe that has something to do with it. But I guess what I am trying to say is, what was so terrible about me that I could not have written the paper. I guess that was what hurt so much. Maybe I’ll post the paper and let the readers tell me what they think. Oh no, how awful. I’m very sorry for you and thank you so much for this comment. It was on my mind for a long time why a gifted writer would just stop writing “only” because she was accused of plagiarism. I was thinking too much in terms of fraud. Although it is awful to be accused of fraud it is far more terrible to be underestimated. I really understand how you felt. I think it sort of cut a nerve in her. She never even gave it a try again. You should let someone read it, definitely. You have to think of it as if he had said to you “Wow, this is so good, how come you are not published?”. What Harlem Renaissance writers could you recomend? I want to read some more of Zora Neale Husrton soon. She is such fascinating character. Really gutsy.